When my kids were in Montessori elementary school, I used to teach yoga as part of PE. 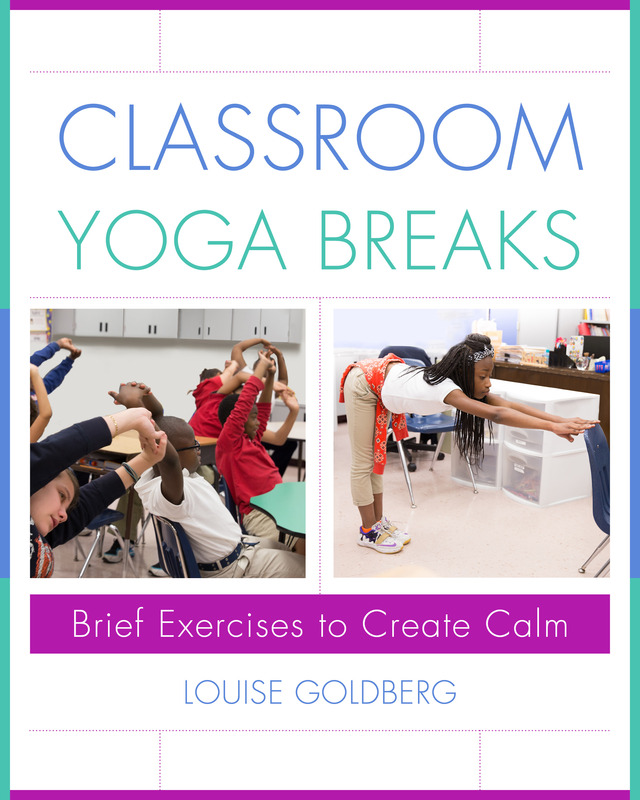 But when I heard that yoga expert Louise Goldberg advocates for short, mini yoga breaks once or more in the school day, I knew she was onto something even better. Yoga movements help kids focus, relax, and feel good about themselves, so of course kids should do a few each day. Now, Louise has made it easy for teachers to give students basic direction. Her new book, Classroom Yoga Breaks: Brief Exercises to Create Calm, features photos of poses, clear instructions--and lots of research about why teachers should want to do this. The book makes a great gift for your own children's teachers, because it will not only assist your child now, it will be a gift that keeps giving for years to come. Why is yoga helpful for kids in school? Kids spend a lot of time sitting in class. That's not only bad for their bodies, it affects their ability to focus. Introducing yoga to the classroom has been shown in research to reduce stress, improve behavior and academic performance, increase time on task, reduce hostility, and ease students' transitions between activities. It can even boost class participation for kids with emotional and behavioral difficulties. This is the reason a growing number of teachers are implementing yoga breaks. Tell me more about helping kids focus. Yoga is a practice of paying attention. Teachers always tell kids to focus, but we don't often teach them how. Yoga gives students a first-hand demonstration of the power of focused concentration. Here's an example: Ask a child to stand on one foot while looking around the room, looking at his phone, or even thinking about what's for lunch. Then ask him to balance the same way while focusing on a spot on the floor a few feet in front of him and noticing his breath gently coming in and out. Because his mind is focused, his balance will improve. Even being aware of taking a few slow, deep breaths while sitting can improve concentration. Are any yoga props or mats needed? Classroom yoga adapts classic yoga poses for schools, where kids are wearing regular street clothes and shoes and don't have mats or props. Desks make a good support for some poses, and others can be done while sitting in the chair. Is it hard for teachers with no yoga training to learn? No. There are plenty of simple techniques teachers can do. Before yoga became my passion and profession, I was an English teacher, and with no formal training I used to do one-minute yoga breaks in my classes all the time. What are some simple sitting poses teachers can have kids do? In their seats, children can do shoulder shrugs, where they elevate their shoulders with an inhalation and drop them with an exhalation a few times. For chest openers, they either lace their fingers behind their chair or hold the side of the seat while leaning back gently. And of course there are breathing poses like soft belly breathing. This is done by lightly interlacing your fingers over your abdomen, and as you breath in deeply through the nose you feel the fingers slightly separate, and as you exhale the fingers come together. One of my favorites is a desk-supported warrior pose, because kids feel very powerful and grounded in this pose. Kids stand next to their desk and place a hand on it, then take a big step forward with one foot, flexing the knee a bit. The free arm is raised overhead and held while taking a few breaths. Then step back and repeat the pose with the opposite foot. Another is a standing twist, where you put your hands on your hips and slowly twist the body in one direction and the head to the other, then, after holding a moment, switch a few times. Cross-patterning the body in this way helps wake up the brain. Are there certain ages that are best for classroom yoga? I've done yoga in classes of 2 year olds all the way through college. That's the great thing about yoga--poses can be easily adapted. If you're doing a balancing pose like a tree pose, for example, smaller kids can raise just the heel of one foot an inch or so off the floor, while older kids can make it more challenging by placing the raised foot as high as the opposite inner thigh. Can kids with special needs do yoga? Absolutely. Yoga is so valuable for special needs kids--this is what my entire first book, Yoga Therapy for Children With Autism and Special Needs, was about. Yoga is calming for these kids. And while they might not understand the directive to slow their breath down, when you have them lean back with their arms clasped behind their chair, it automatically slows their breath--and brain--down. Teachers of special needs kids do need to use a little more caution, though. Forward bends, for example, should be avoided for kids prone to seizures. In your experience, is yoga something teachers want in their classrooms? As a former teacher, I can attest that teachers are always looking for ways to get kids to calm down and focus. I've heard from a teacher who implemented my yoga mini-breaks that her kids grasp complex math concepts more readily after a yoga break. Others find it helps with test anxiety--which can start weeks before a big test. And when a school counselor recently introduced a district-wide professional development program to reduce anxiety using my book as the text, she filled up the 50 open slots almost immediately. Classrooms today are more stressful than ever, so a tool that's free and simple and requires little preparation is a wonderful gift for teachers. Learn more about Louise and her work at CreativeRelaxation.net. Meryl Davids Landau is the author of the new book Enlightened Parenting: A Mom Reflects on Living Spiritually With Kids. Learn more about Meryl's books and other writing at MerylDavidsLandau.com.